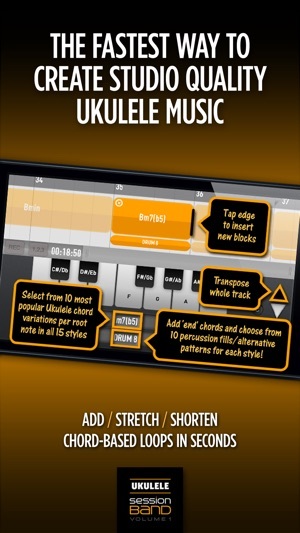 The dedicated Ukulele version of the award-winning music making app is here! 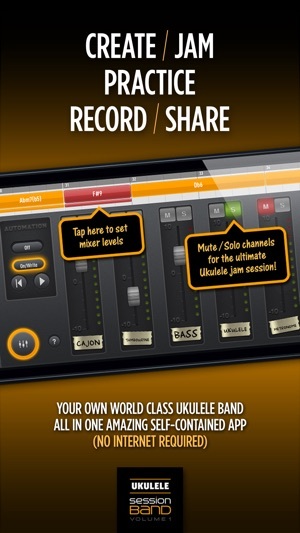 Create stunning Ukulele tracks to your own chords in minutes with SessionBand - the world's only chord-based audio loop apps. It's the ultimate Ukulele play along and the perfect tool for songwriters and performers - wherever you are and whatever your level of ability. 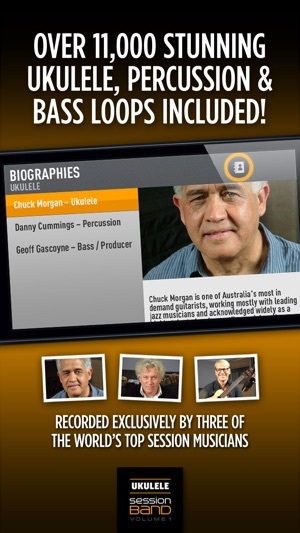 Volume 1 includes 15 Ukulele band styles recorded exclusively for SessionBand by three of the world's leading session musicians: everything you need to produce your own studio quality tracks with over 11,000 chord-based Ukulele, cajon, shaker and bass loops included in the download. 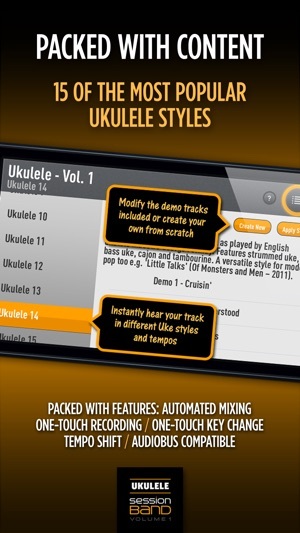 Create your own full and contemporary Ukulele tracks in minutes with 15 distinct styles inspired by legends of popular Ukulele music from George Formby through to Jack Johnson, Jason Mraz and Bruno Mars. Whether you're a songwriter, instrumentalist, producer or simply love Ukulele music, SessionBand instantly converts the chords you select into great-sounding audio. And with a host of pro features like automated mixing, auto-transpose, one-touch live recording, real-time tempo shift and Audiobus compatibility - allowing you to seamlessly export our unique content into other top music apps like GarageBand - it has never been easier or quicker to create your own studio quality music, even if you can't play a note! 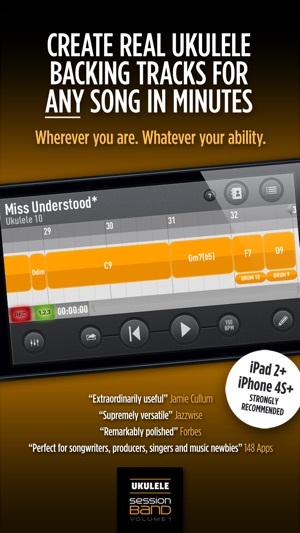 Note: We recommend using SessionBand apps with iPad 2, iPhone 4S or newer devices. iPhone users please note: due to compatibility issues with Audiobus we strongly recommend the use of headphones while connecting to Audiobus). * From 85bpm through to 200bpm. Easy to used and create your music track with this instrument. I’ve been using this for 3 years. Can’t play a uke...arthritic fingers...but sure can be creative with this app.